Publication of the Ultimate Classic FM Chart and a subsequent Guardian article has sparked some useful debate about what Kate Molleson terms in her article 'gateway drugs to classical music'. This debate prompts me to republish an article I wrote back in 2005 titled 'My first classical record' which I have conflated with a relevant extract from an even earlier post about collaborative filtering. Too little attention is paid to how people 'get' classical music. I hope republishing these somewhat discursive pieces from a more innocent time of music blogging may prompt others to usefully share the experience of their first classical record. What was the first classical record you bought? 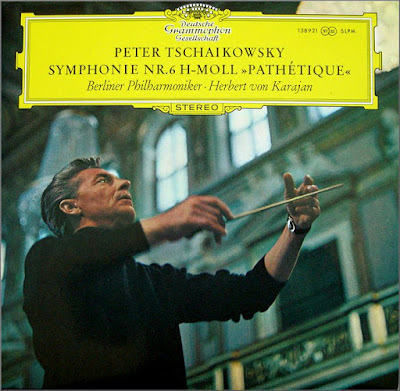 Mine was an LP of Herbert von Karajan conducting Tchaikovsky's 6th Symphony, the 'Pathetique', with the Berlin Philharmonic on Deutsche Grammophon 13892SLPM. I bought it in 1969 from a music shop in Reading where I was at University. The shop had listening booths with acoustic tiles, and it sold sheet music, musical instruments, and classical records. The LP is playing as I write. I have just serviced my Thorens TD125 turntable with SME arm (a capacitor in the motor control circuit blew after 30 years) seen below. The LP sound through my Arcam Alpha 10 amplifier and B & W Nautilus 803 speakers is magnificent, when the planets are aligned beneficially vinyl can still deliver a musicality that surpasses CD. (Thankfully I have kept my LP collection, and the surfaces are immaculate apart from the inevitable pressing blemishes). What overgrown path led me to buy that LP of the 'Pathetique'? Well, I can answer that question quite easily. Some years previously (1961?) I had been taken by my parents, while on holiday, to hear Tchaikovsky 6th played by the Bournemouth Symphony Orchestra in the Winter Gardens in Bournemouth. The conductor was a dynamic young Singaporean maestro Choo Hoey. (Googling for Choo Hoey pulls up references to a conductor active in the Far East, could this be the same one? - I must have seeen him more than forty years ago). Could it have been that brooding Siegfried Lauterwasser cover photograph of Karajan (this link gives an interesting perspective on Lauterwasser, who was HvK's 'court' photographer) that headed me towards a career that took me from the BBC, and then to EMI where I worked on some of Karajan's projects including his recording of Debussy's operatic masterpiece Pelleas et Melisande? That project summed up the Karajan conundrum completely, sublime music making and an odious personality. My favourite Karajan story is about when he was conducting at Bayreuth with Hans Knappertsbusch. There were just two lavatories at the end of a long corridor backstage. Karajan's personal secretary, it is said, put a notice on one, 'For the exclusive use of Herr Karajan'. An hour later a notice appeared on the other one written by Knappertsbusch, 'For all the other arseholes'. I was also involved with others in the Karajan circle. When Walter Legge died in 1979 I created an exhiibition at short notice for the foyer of the Royal Festival Hall in London. 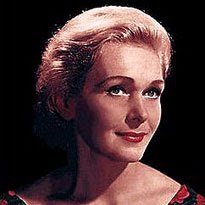 Legge's wife Elizabeth Schwarzkopf (below) viewed the exhibition before a Philharmonia Orchestra memorial concert, and complained to me that I had described Legge in the display as an 'entrepreneur.' Now I have often been wrong in my choice of words, but in that instance I am convinced I was dead right. But the path didn't just lead me to Karajan and his circle . My second LP was Bernard Haitink conducting the London Philharmonic in Holst's Planet Suite (A strange choice, the reading with its odd tempi has long since been deleted). 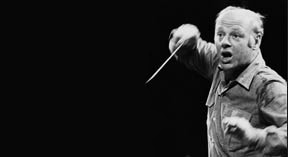 Haitink resoundingly disproves the rule that you need an odious personality to be a great conductor. (And also Colin Davis - interesting he has no 'personal' web site, this is a quote from the article I've linked to.. I detest all that charisma stuff. It leads to unmusical things like the pursuit of power. The older I get, the more wary I am of power. It is a beastly ingredient in our society - he said that in 1990!). I lunched once with Haitink in the staff refectory at Glyndebourne to seek approval for the cover design of his recording of the Brahms Double Concerto with Perlman and Rostropovich (approval was given without a hint of the vanity and petulance cultivated by Riccardo Muti and others). In those days conductors had cover approval in their contracts, nowadays they have to start their own record labels to make a recording. While driving down to Glyndebourne I had been listening to Previn's first (and by far the best) recording of Walton's First Symphony on RCA. I suggested that Haitink looked at the score, and he subsequently recorded it for EMI. It wasn't a great commercial success, it was a lesson in leaving A & R planning to the professionals. (But I do remember suggesting that Previn recorded the Korngold Violin Concerto and Symphony in F sharp in the 1980s, only to be told he wouldn't touch film music. It is amazing how principles adapt to economics). Haitink later did go on to record a fine cycle of the Vaughan Williams symphonies for EMI after I left. I am always puzzled as to why this fine conductor never plays or records Sibelius. With his achievements recording Bruckner I have always thought Haitink would be a natural Sibelian. Just recently I've been interested, used, and worked on the peripheries of collaborative filtering. Amazon's recommendations are both maddening and very useful, and I have to say I've bought or borrowed from the library many recommendations. Most of my knowledge of, and passion for classical music has come from the serendipity of switching on BBC's Radio 3 before it was dumbed-down to the commercial benchmark. [This was written in 2004!, hearing a piece of music, and following that thread onwards. Like many I came to Mahler through the serendipidity of Visconti's Death in Venice in the early-70's, a serendipity aided and abetted by the Mahlerian style being digestible by a graduate who had been living with the Pink Floyd, Led Zeppelin and the Moody Blues for a few years. That's why I'm interested in musicplasma which I mentioned in an early post, it offers spontaneous links from one musician to another. My dream is to be able to work back from a CD and produce a map of every thread that led me to play it, every piece of music on route, and most importantly every fork that I took to reach it, and equally importantly the forks that I didn't take. I selfishly think that recreating even parts of that route may lead readers to similar delights and discoveries to those that fill my days with sunshine. Article first published on April 1, 2005. Any copyrighted material is included as "fair use" for critical analysis only, and will be removed at the request of copyright owner(s). Now also on Facebook and Twitter. Those interested in the Internet as an academic resource and not as a platform for slinging mud should note that almost every single external link in my original 2005 article - and there were a lot of them - was broken. Link rot is a massive and overlooked problem. But as it does not affect social media it will presumably remain overlooked. 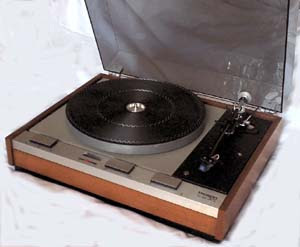 I was in high school, 1968, and I was walking through the school library when I saw that one of the study desks with a turntable had a record turning round and round with no one listening to it. 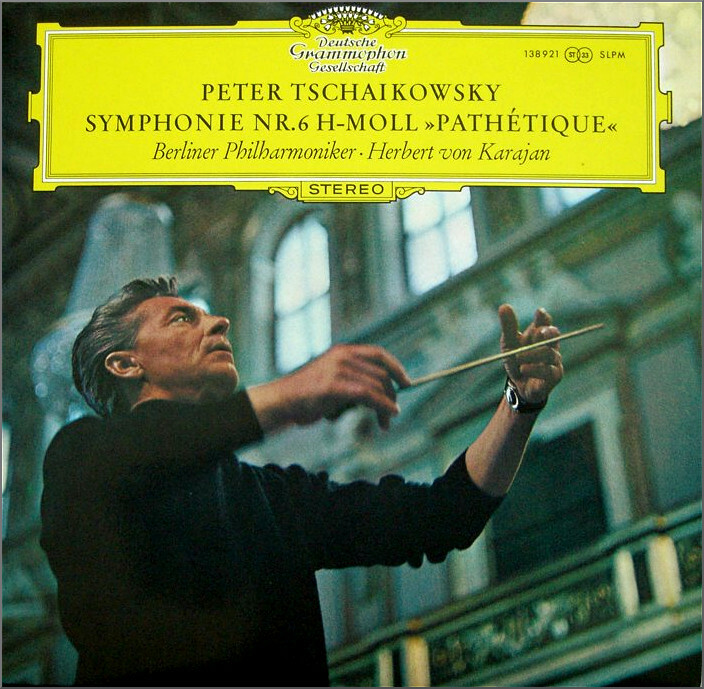 So, impulsively, I sat down and listened to Beethoven Symphonies 1 and 2 (Karajan). I was almost late to my next class. I checked it (and the other records in the '60 Karajan Beethoven cycle) out from the library, then bought them. I've moved beyond Karajan's Beethoven, but I still listen from time to time to the Karajan Beethoven 1. I was badgering my parents about classical music because my father kept playing the Klemperer Beethoven 6,with the Philharmonia. I was given a Beecham lp of the water music and Eine Kleine... When I saved enough pocket money I bought an EMI disc of Elgar and RVW. I presume it was Boult. Enigma and Tallis. The Bernstein Harvard lectures illuminated music theory for me as a schoolboy in the 70s like nothing else. Imagine a 13 year-old asking a teacher if that bar included an apoggiatura? I hold no brief for Bernstein the conductor, composer, performer, song writer. As a teacher, he was compelling. Always. In the other arts, he burned fitfully.